Vijay, S., S.A. Khan, A. Kusk, A. M. Solgaard, T. Moon, and A. A. Bjørk. 2019. Resolving seasonal ice velocity of 45 Greenlandic glaciers with very high temporal details. Geophysical Research Letters, 46(3): 1485-1495. doi:10.1029/2018GL081503. Enderlin, E. M., C. J. Carrigan, W. H. Kochitzky, A. Cuadros, T. Moon, and G. S. Hamilton. 2018. Greenland Iceberg melt variability from high-resolution satellite observations. The Cryosphere 12: 565-575, doi:10.5194/tc-12-565-2018. Moon, T.A. 2018. Geoengineering might speed glacier melt. Nature 556: 436. doi:10.1038/d41586-018-04897-5. Moon, T. 2018. 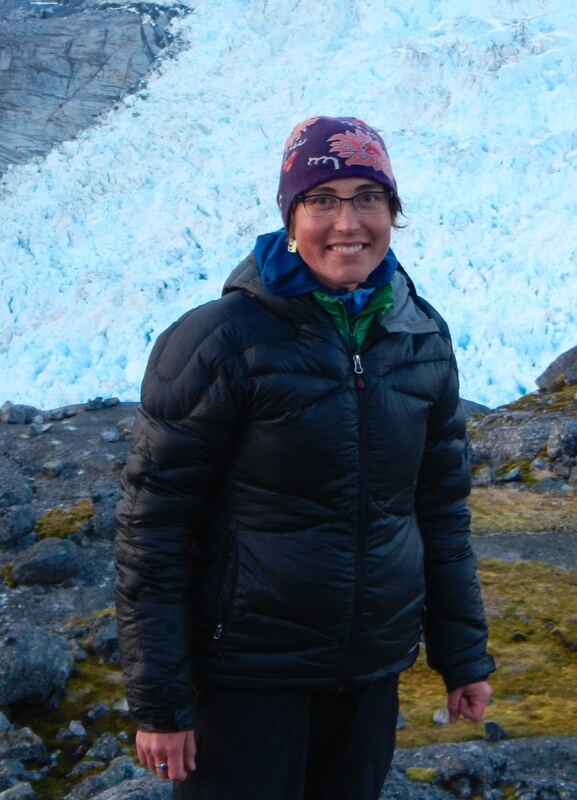 Looking up: Women in Arctic science. The Arctic Institute. Moon, T., A. Ahlstrøm, H. Goelzer, W. Lipscomb, and S. Nowicki. 2018. Rising oceans guaranteed: Arctic land ice loss and sea level rise. Current Climate Change Reports 4(3): 211-222, doi:10.1007/s40641-018-0107-0. Ran, J. M. Vizcaino, P. Ditmar, M. R. van den Broeke, T. Moon, C. R. Steger, E. M. Enderlin, B. Wouters, B. Noël, C. H. Reijmer, R. Klees, M. Zhong, L. Liu, and X. Fettweis. 2018. Seasonal mass variations show timing and magnitude of meltwater storage in the Greenland Ice Sheet. The Cryosphere 12: 2,981-2,999, doi:10.5194/tc-12/2981-2018. Bondzio, J. H., M. Morlighem, H. Seroussi, T. Kleiner, M. Rückamp, J. Mouginot, T. Moon, E. Y. Larour, and A. Humbert. 2017. The mechanisms behind Jakobshavn Isbrae's acceleration and mass loss: a 3D thermomechanical model study. Geophysical Research Letters 44(12): 6,252-6,260. doi:10.1002/2017GL073309. Moon, T. 2017. Saying goodbye to glaciers. Science 356(6338): 580-581. doi:10.1126/science.aam9625. Moon, T., D. A. Sutherland, D. Carroll, D. Felikson, L. Kehrl, and F. Straneo. 2017. Subsurface iceberg melt key to Greenland fjord freshwater budget. Nature Geoscience 11: 49-54, doi:10.1038/s41561-017-0018-z. Carroll, D., D. Sutherland, B. Hudson, T. Moon, G. Catania, E. Shroyer, J. Nash, T. Bartholomaus, D. Felikson, L. Stearns, B. Noel, and M. van den Broeke. 2016. The impact of glacier geometry on meltwater plume structure and submarine melt in Greenland fjords. Geophysical Research Letters 43, 9739-9748. doi:10.1002/2016GL070170. Fahnestock, M., T. Scambos, T. Moon, A. Gardner, T. Haran, and M. Klinger. 2016. Rapid large-area mapping of ice flow using Landsat 8. Remote Sensing of Environment 185: 84-95. doi:10.1016/j.rse.2015.11.023. Joughin, I., B. Smith, I. Howat, H. Fricker, T. Scambos, and T. Moon. 2016. A SAR record of early 21st century change in Greenland. Journal of Glaciology 62 (231): 62-71. doi:10.1017/jog.2016.10. Laidre, K. L., T. Moon, D. Hauser, R. McGovern, M. Heide-Jorgensen, R. Dietz, and B. Hudson. 2016. Use of glacial fronts by narwhals (Monodon monoceros) in West Greenland. Biology Letters 12, 20160457. doi:10.1098/rsbl.2016.0457. Fahnestock, M., T. Scambos, T. Moon, A. Gardner, T. Haran, and M. Klinger. 2015. Rapid large-area mapping of ice flow using Landsat 8. Remote Sensing of Environment 185: 84-94. doi:10.1016/j.rse.2015.11.023. Moon, T. and I. Joughin. 2015. Greenland Ice Sheet surface velocities: New data sets. Arctic Report Card: Update for 2015. Moon, T., I. Joughin, and B. Smith. 2015. Seasonal to multi-year variability of glacier surface velocity, terminus position, and sea ice/ice mélange in northwest Greenland. Journal of Geophysical Research-Earth Surface 120(5): 818-833. doi:10.1002/2015JF003494. Moon, T. 2014. Greenland outlet glacier ice-flow variability. U.S. CLIVAR Variations Newsletter 12(2): 1-6. Moon, T., I. Joughin, B. Smith, M.R. van den Broeke, W.J. van de Berg, B. Noël, and M. Usher. 2014. Distinct patterns of seasonal Greenland glacier velocity. Geophysical Research Letters 41(20): 7209-7216. doi:10.1002/2014GL061836. Joughin, I., B. Smith, I. Howat, T. Scambos and T. Moon. 2010. Greenland flow variability from ice-sheet-wide velocity mapping. Journal of Glaciology 56(197): 415-430. doi:10.3189/002214310792447734. Joughin, I., S. Das, M. King, B. Smith, I. Howat, and T. Moon. 2008. Seasonal speedup along the western flank of the Greenland Ice Sheet. Science 320(5877) 781-783. doi:10.1126/science.1153288. Joughin, I., I. Howat, R. Alley, G. Ekstrom, M. Fahnestock, T. Moon, M. Nettles, M. Truffer, and V. Tsai. 2008. Ice-front variation and tidewater behavior on Helheim and Kangerdlugssuaq Glaciers, Greenland, Journal of Geophysical Research-Earth Surface 13(F1). doi:10.1029/2007JF000837. Moon, T. and I. Joughin. 2008. Changes in ice front position on Greenland’s outlet glaciers from 1992 to 2007. Journal of Geophysical Research-Earth Surface 13(F2). doi:10.1029/2007JF000927. Joughin, I. and T. Moon. 2015. MEaSUREs annual Greenland outlet glacier terminus positions from SAR Mosaics. Boulder, CO: Natiional Snow and Ice Data Center. Digital media. doi:10.5067/DC0MLBOCL3EL.